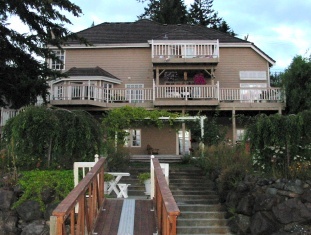 Gig Harbor Bed & Breakfast presents Rosedale by the Bay, Gig Harbor Washington. Region: Kitsap Peninsula, Gig Harbor near Tacoma and Seattle. Located on a quiet inlet on Puget Sound, three miles west of downtown Gig Harbor on the Kitsap Peninsula, Rosedale by the Bay is the place for serious relaxation. As quiet inlet waters lap the dock, Rosedale’s three luxurious guestrooms, spacious common rooms, fragrant gardens, soothing hot tub and gourmet food await you. Hot beverages, delivered to your room provide time to savor the morning solitude before your hearty breakfast is served in the main dining area. Homemade cookies, teas, cocoa and juice drinks are available all day. Our desire is to provide you with carefree relaxation while we tend to all your needs. We provide an environment where you can rest in an elegant setting. All rooms have private baths, TV/VCR/CD players, one Jacuzzi suite, one with kitchenette, king/ queen beds. Free movie library. 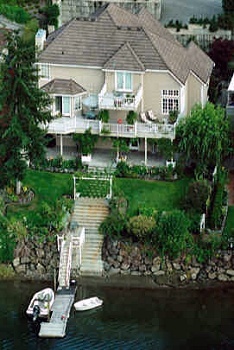 Outside dock, two large decks overlooking water. Hot tub. Visa, MC and AMEX accepted.